The pilgrims termed as Uttrakhand-Yatra, which includes the pilgrimage to Badrinath, Kedarnath, Gangotri. As the faithful and righteous soul proceeds further higher and higher through the Himalayas, one seems to be getting near and nearer to God. Shedding off the worldly bondages one by one. Meeting and assistance on arrival and transfer to hotel. Full-day sight seeing of Delhi, visiting Laxmi Narayan Temple, Hanuman Mandir, India Gate, Gauri Shankar Temple, Qutab Minar, Chhattarpur Temple, Bahai Temple and Akshardham Temple.Overnight at hotel. Early morning depart by car/coach for Dakpahar. On arrival, visit the Paonta Sahib Gurdwara where the roaring Yamuna flows silently near the gurdwara. Dinner and stay at Tourist Rest House. After breakfast, depart by car/coach for Sayanachatti, lunch enroute. On arrival, dinner and overnight at Tourist Rest House. After breakfast, depart by car/coach for Hanumanchatti (6kms ½ hr). After visiting Hanumanchatti, depart on foot for Yamunotri (14 kms / 4 hrs) source of River Yamuna situated in the opposite direction on Gangotri at an elevation or 3235 m above sea-level on the Bandarpunch peak, where the shrine is one of the four dhams, arriving there at 1300 hrs. After lunch, Darshan and Pooja, depart Yamunotri at 1530hrs for Jankichatti (6kms, 3 ½ hrs. ), reaching their at 19:00 hrs. On arrival, dinner and overnight at Tourist Rest House. After an early breakfast, depart on foot for Barkot (41 kms / 5 hrs) arriving there at noon. 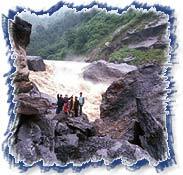 After lunch, depart at 1300 hrs by bus for Uttarkashi (83 kms / 4 hrs)-situated on the back of River Bhagirathi. On arrival, visit Vishwanath Temple. Dinner and overnight at Tourist Rest House. Early breakfast, depart by car/coach for Gangotri (100 kms / 4 hrs) situated at an elevation of 3200 m above sea-level amidst captivating surroundings. 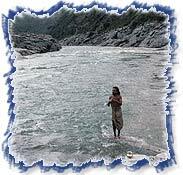 Mythology has it that Ganga came down to earth as a result of King Bhagirath's severe penance. It is the place where this daughter of heaven landed on earth. By November, Gangotri is snowbound and it is believed that the Goddess retreats to Mukhba, her winter abode 12 kms downstream. Lunch and trek to Bhojbasa (16 kms / 6 hrs) Dinner and overnight at Tourist Guest House. Early breakfast, and depart on foot for Gaumukh (3 kms / 2 hrs)-the glacier which is the source of the mouth of Bhagirathi (Ganga) is held in high esteem by the devotees. 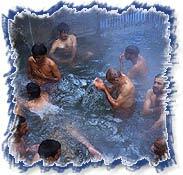 Take a holy dip in the chilling icy water, perform Pooja and return to Bhojbasa. Lunch at 1100hrs at Bhojbasa and proceed for Gangotri (19 kms / 5 hrs) by car/coach at 1200 hrs. "Aarti', Darshan and Pooja at Gangotri. Dinner and overnight at Tourist Rest House. After an early breakfast, proceed by car/coach for Uttarkashi (100 kms / 4 hrs). After lunch, leave by car/coach at 1300 hrs for Srinagar (211 kms/2 ½ hrs)-situated on the bank of River Alaknanda, which used to be capital of Garhwal before British period. On arrival, dinner and overnight at Tourist Rest House. Morning depart by car/coach for Chandrapuri (56 kms 2 ½ hrs). Breakfast on arrival and trek to Gaurikund (5 kms/2 hrs). Take a holy dip in Taptkund & Gourikund, have lunch and trek to Kedarnath (14 kms/ 5 hrs. )-one of the four Dhams dedicated to Lord Shiva. Legend has it that the Pandavas of Mahabharat epic underwent severe penance to atone the killing of the their kith and kin in the great battle of Kurukshetra and established this shrine which has one of the twelve Jyotrilingas' of Lord Shiva. "Aarti" Darshan & Pooja at Kedarnath. Dinner / overnight at Tourist Rest House. After breakfast, return on foot to Gaurikund (14 kms / 4hrs). Lunch on arrival at 1400hrs. Proceed by car/coach at 1500 hrs for Rudraprayag ( 87kms/3hrs). Dinner and overnight at Tourist Rest House. After early breakfast, proceed by car / coach for Joshimath . Lunch on arrival at noon. Depart at 1400 hrs for Badrinath (42 kms / 2 hrs) 3133 m above sea level-reestablished in the 9th century by Shankaracharya. 'Aarti', Darshan & Pooja on arrival. Dinner / overnight at Tourist Rest House. After breakfast, perform "Aarti', Darshan, Pooja and take a holy dip in the Tapta Kund at Badrinath-considered a healthy ritual with the water having medicinal properties. Lunch and proceed by car / coach for Joshimath (42 kms / 2 hrs) at 1400 hrs. On arrival, visit Narasinh Temple and Jyotirmath Temple-where Adi Shankaracharya performed penance under a tree in the 8th century and established the math. Dinner and overnight at tourist Rest House. After breakfast, depart by car / coach for Srinagar (146 kms / 6 hrs). Lunch on arrival (1400 hrs) and proceed by car / coach for Kaudilya (30 kms / 3 hrs). Dinner/ overnight at Tourist Rest House. Early morning, depart by car / coach for Haridwar (55 kms/ 4 ½ hrs). On arrival, breakfast, and sightseeing of Haridwar. After lunch at 1300 hrs depart by car/ coach for Delhi (200 kms 5 ½ hrs). On arrival check-in at hotel.